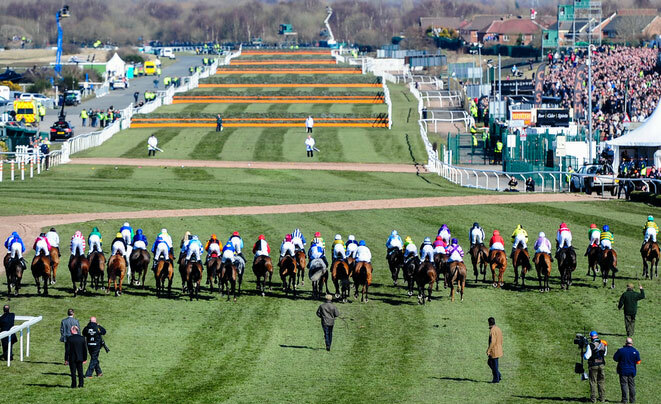 The false start curse struck again in this year’s Crabbie Grand National, as the race got underway at the second time of asking with the sheepskin noseband of Battle Group up in the air with the horse refusing to start. Hazy sunshine broke through the muggy sky as the race lost 3 runners in the first three fences and Sam Waley-Cohen hit the front on Long Run, just a fraction ahead of the closely packed field. Last Time D'Albain was the next to go at Becher’s and pre race joint favourites Teaforthree and Double Seven sat in 6th and 7th respectively. After several fallers at Valentine’s, a fence that saw the end of Long Run, Mountainous and the Aidan Coleman owned Rainbow Hunter, Across the Bay took it up just ahead of Mr Moonshine with last year’s National winning jockey Ryan Mania in the saddle. Across the Bay ridden by Henry Brooke still lead jumping over the Chair, narrowly avoiding disaster thanks to an errant riderless horse. The Bay recovered to maintain his advantage over Colbert Station who was now in 2nd place, but the 15th saw the end of Teaforthree’s and Nick Schofield’s National for another year. Two stray horses were to prove to be Across the Bay’s downfall, as they carried the unfortunate Henry Brooke and his ride well wide, allowing the entire field to pass by. He did rejoin the race, but was never again in contention. Noel Fehily seized the opportunity this stroke of bad fortune had provided, as he steered Rocky Creek to the front of the pack. Colbert Station remained in second place as the race passed in front of the cheering crowd and the rain began to fall and A P McCoy was well placed on Double Seven, hoping to make a successful return to the race after a few years of disappointment. As the field stretched going over Becher’s Brook in worsening weather conditions, Rocky Creek was still holding his position at the head of the race. Pineau de Re was making his first tentative moves towards the front at this point with the horse going well in around 6th place. As they turned for home, there were 2 clear leaders, with Rocky Creek vying for first with Pineau de Rey who was really picking up the pace. This was a decisive moment as Leighton Aspell rode strongly over the last, pulling 3 lengths clear and having cleared the elbow, it was evident that Pineau de Rey had the legs to stay the course and he did so by 5 lengths followed by Balthazar King and A P McCoy a close third on Double Seven. It was a win for Aspell on his 7th Grand National appearance and one that earned his jubilant owners Barry Connell and John Provan a cool £561,300 in prize money. 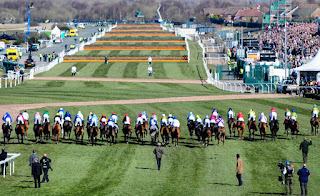 After the race, the World Horse Welfare stated that they were happy with the modifications that had been made and the effect they had had on equine welfare at this year’s race. Another reason to feel good about racing on this most momentous of days.